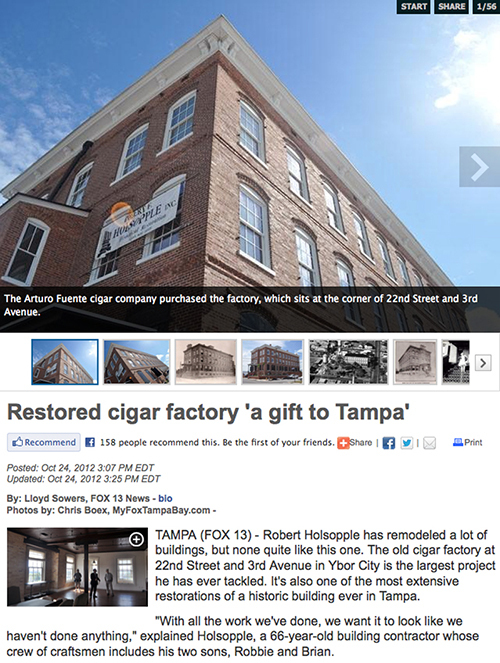 TAMPA (FOX 13) – A man whose name is synonymous with Ybor City cigars was honored by the city today. Mayor Bob Buckhorn unveiled a new street name: Part of Second Avenue will now be known as Carlos Fuente’s Way. 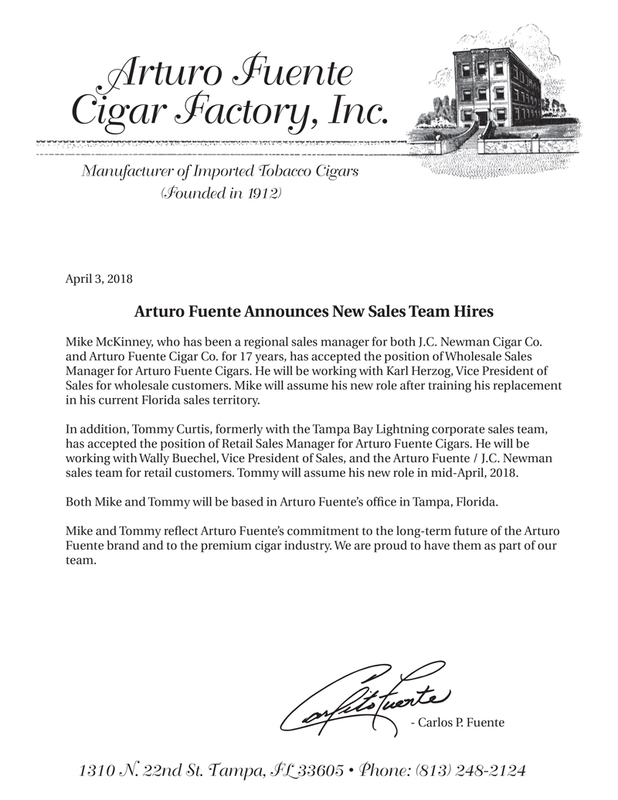 Twenty-five years ago, Tampa’s two oldest family-owned cigar companies merged. 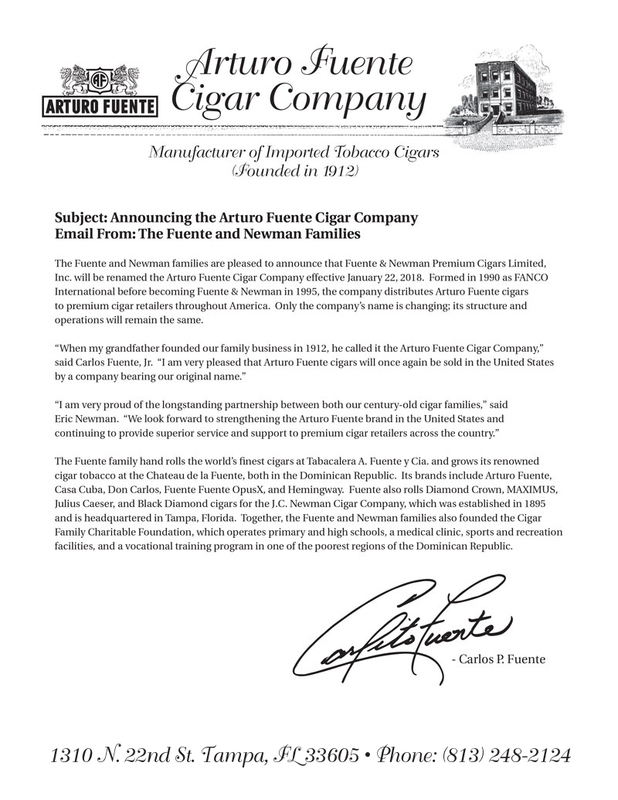 The J.C. Newman Cigar Company and the Arturo Fuente Cigar Company became the Fuente and Newman Cigar Company. During the 82nd annual International Premium Cigar & Pipe Retailers trade show held in Las Vegas in July, we had the opportunity to spend some quality time with the people who make some of the finest cigars in the world. In the coming weeks, we’ll share with you the conversations that we had with those influential cigar makers, highlighting the passion that they have for their craft and their recommendations for cigar smokers who are looking to develop a discerning palate for quality tobacco. 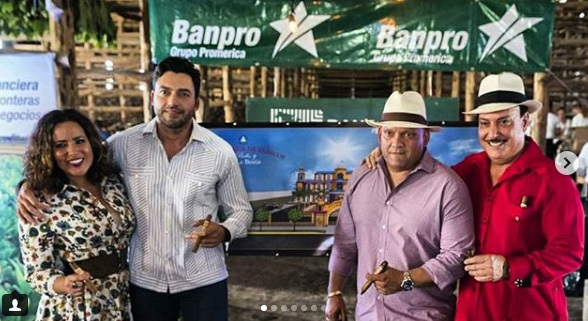 We won’t give away too much here, but what we will say is that from all of those conversations, one thing was made abundantly clear: Cigar making is an art form, one that—in most cases—has been passed down through multiple generations of a family, and one that remains a labor of love for all who excel at it. This week’s video highlights the people behind the business of luxury cigars and features legends of the craft and newcomers to the trade. When a family-owned business makes it for 100 years, it’s a big deal. For the Fuentes, it’s even bigger because the road has been neither smooth nor easy. In fact, the family has endured many a setback, only to come back stronger than before. 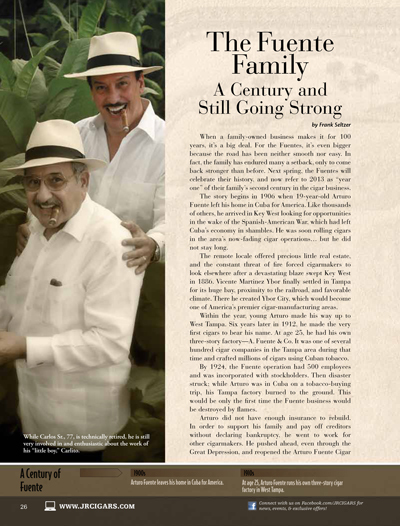 Next spring, the Fuentes will celebrate their history, and now refer to 2013 as “year one” of their family’s second century in the cigar business. The story begins in 1906 when 19-year-old Arturo Fuente left his home in Cuba for America. Like thousands of others, he arrived in Key West looking for opportunities in the wake of the Spanish-American War, which had left Cuba’s economy in shambles. He was soon rolling cigars in the area’s now-fading cigar operations… but he did not stay long. The remote locale offered precious little real estate, and the constant threat of !re forced cigarmakers to look elsewhere after a devastating blaze swept Key West in 1886. 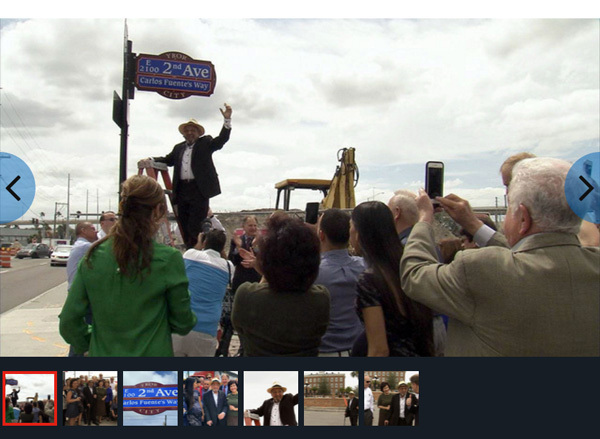 Vicente Martinez Ybor finally settled in Tampa for its huge bay, proximity to the railroad, and favorable climate. There he created Ybor City, which would become one of America’s premier cigar-manufacturing areas. 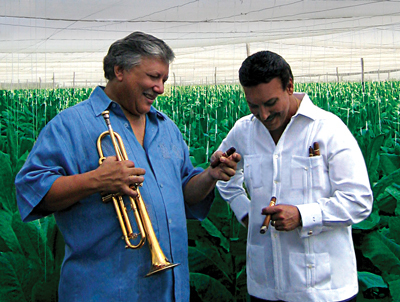 Los Angeles, CA — Legendary musician Arturo Sandoval has been nominated for two 2013 Latin Grammy Awards: Album of the Year, Gian Marco’s Versiones (Producer) and Best Traditional Tropical Album, Un Siglo De Pasión. (Dedicated to the 100 anniversary of the Fuente Family) The award ceremony will take place on November 21, 2013. Go to www.latingrammy.com/es for more information. Sandoval has been awarded 9 Grammy Awards, and nominated 19 times; he has also received 6 Billboard Awards and an Emmy Award. The latter for his composing work on the entire underscore of the HBO movie based on his life, “For Love or Country” starring Andy Garcia. His two latest Grammy award winning albums, “Dear Diz “Everyday I think of you” and Tango “Como Yo Te Siento” are now available worldwide. Soon to be released, is a new book chronicling his relationship with Dizzy Gillespie entitled “The Man Who Saved Me”. Arturo Sandoval’s versatility can be heard on recordings with everyone from Dizzy Gillespie, Woody Herman, Woody Shaw, Michel Legrand, Bill Conti, and Stan Getz to Johnny Mathis, Frank Sinatra, Paul Anka, Rod Stewart and Alicia Keys amongst many others. He has performed with John Williams with the Boston Pops, and in the Super bowl with Tony Bennett and Patti LaBelle. Arturo Sandoval reaches beyond the scope of mere effort. His struggles while in Cuba and since his defection have given him more energy and strength, urging him to accomplish and surpass his childhood dreams. Filled with a virtuoso capability, he desires nothing more than to share his gift with others who feel the same intense adoration for music as he does. One frequently speaks of Arturo Sandoval’s virtuoso technical ability or his specialty in high notes, but he who has seen him on the piano, lyrically improvising a ballad, or has had the opportunity to enjoy the diversity of his music, through his compositions from the most straight ahead jazz, Latin jazz or classical, knows that Arturo Sandoval is a prominent musician, and one recognizes that Arturo is one of the most brilliant, multifaceted and renowned musicians of our time. This year Arturo will be receiving the Presidential Medal of Freedom from President Obama.